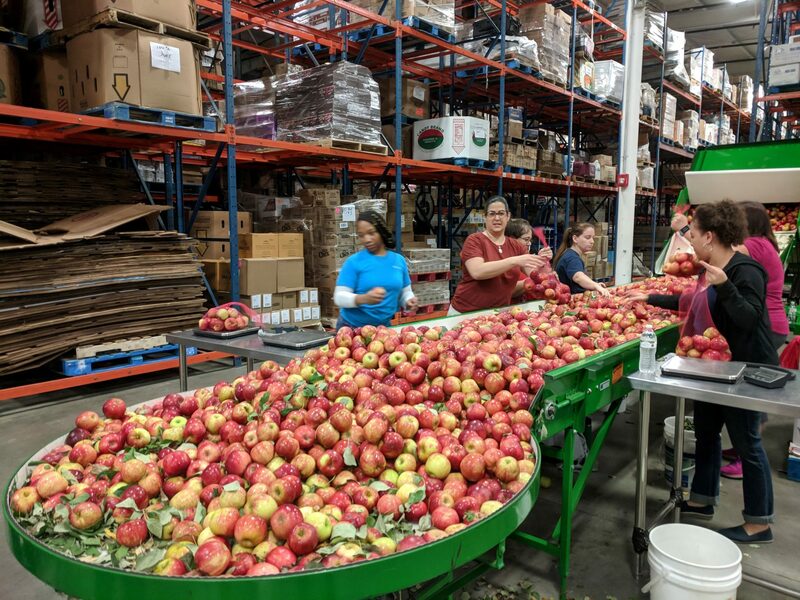 Volunteers from Highmark sort apples on the "Green Machine" at the Central Pennsylvania Food Bank. The proposal has those working to fight hunger in central Pennsylvania concerned. (Harrisburg) — Leaders in the U.S. House and Senate are trying to reconcile two versions of a bill to fund farm programs and nutrition benefits before a Sunday deadline. The Senate version of the Farm Bill would keep things largely the same, but the House version calls for expanded work requirements for some people who receive Supplemental Nutrition Assistance Program (SNAP) benefits, previously known as food stamps. For able-bodied adults without dependents, lawmakers in the House want to raise the number of work or job-training hours required for benefits from 20 to 25 per week. They also want to expand the age for work requirements to 18-59, instead of the current 18-49. The proposal has those working to fight hunger in the midstate concerned. In spite of record low unemployment, the food bank is serving about the same number of people today as it did post-Great Recession in 2012. Arthur said the proposed work requirements could put a burden on states to administer job-training programs. “We believe the dollars that are forced to go there come out of the benefits for people in need and also, our state budget really doesn’t have room for big new programs like that,” he said. Arthur said his organization has been ramping up capacity over the past several years. But the food bank is stretched. And if Congress makes it harder to qualify for SNAP benefits, Arthur said tens of thousands more Pennsylvanians could turn to food banks. “That is folks in need who are not able to go into the grocery store and spend the SNAP benefits to buy food, which then impacts the grocer, all the food producers, all the way back to the farm,” he said. If those resources are strained, food pantries may have to turn people away. Or they might not be able to provide the same range and quality of food. The Central Pennsylvania Food Bank distributes dry goods, as well as fresh produce, meats, and dairy products. Nutrition assistance makes up the majority of the massive spending bill, though it also includes programs like crop insurance for farmers. Agriculture advocates say it’s important to pass a strong Farm Bill at a time when farmers’ incomes are at a low point, and international tariffs are causing uncertainty. Pa. House passes gun-restricting domestic violence bill. It's an outlier.